PQube today announced Gun Gun Pixies, a “third-person shooter and 3D platformer-in-one” that “sends two tiny girls from outer space to earth, so that they can infiltrate a women’s college dormitory.” It was originally brought to the PS Vita by Compile Heart. The crazy Japanese third-person shooter and 3D platformer in one sends two tiny girls from outer space to earth, so that they can infiltrate a women’s college dormitory. Once arrived, the Pixies stealthily bustle about the regular sized girls’ towering legs and rooms to fulfil their mission: study human behaviour in order to help overcome the social issues of their beloved home planet! If we didn’t have you at “tiny girls from outer space infiltrate a women’s dormitory”, the Day One Edition of Gun Gun Pixies comes in a special Nintendo Switch collector’s box that includes the game and a high quality artbook! Countless concept drawings, gorgeous key artworks, all characters in alternative outfits and more make this goodie an indulgence for every manga/anime lover. 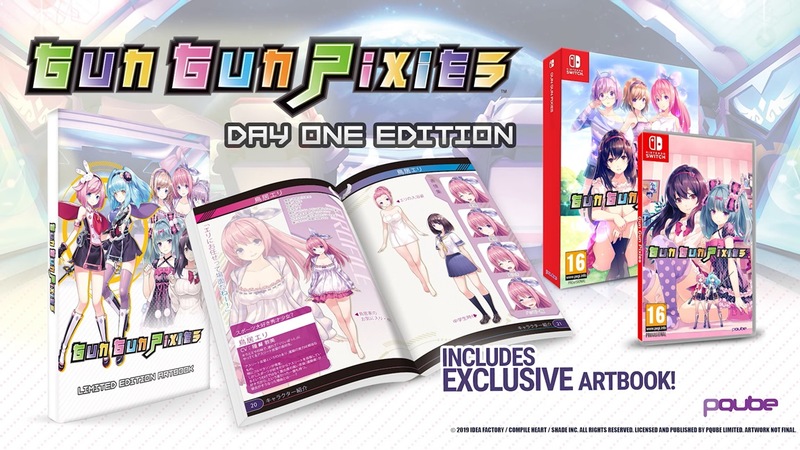 Gun Gun Pixies is due out on Switch later this year.